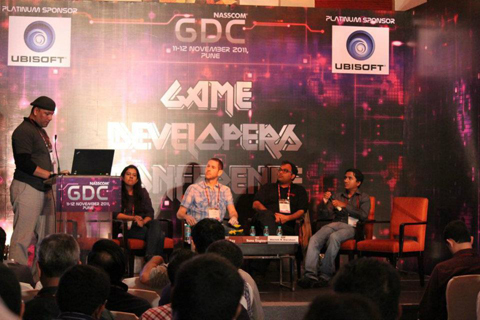 The Nasscom GDC 2011 ended in Pune yesterday making it one of the well attended events in India. Since we don’t have many conferences like these happening here, it was great seeing this one unfold connecting the Indian gaming community on a single platform. It was also encouraging to see gaming now being accepted as an industry with students taking it up as a career option – something which did not exist some years back. The 2 days of the event had back-to-back sessions covering various aspects of the state of the gaming industry, gaming platforms and technologies and sessions for budding entrepreneurs. I was invited as a part of a panel discussion covering Flash vs Unity vs HTML5 and it was a fairly well attended session (we had 2 very competitive sessions running parallelly so a well attended session is a compliment!). It was great to see that most of the audience were into Flash development at some level and keen to know what the panel had to say about the three most spoken about technologies in the recent times. The panel came with their expertise and spoke about the strengths of the platform they specialized in. HTML5 is a platform that Zynga believes will be the future with social games. They are already looking into it; their Words with Friends being a classic example of a successful HTML5 social game going cross platform. Cha Yo Wo on the other hand felt that HTML5 has it’s disadvantages and is better suited for enterprise applications rather than game development, especially when getting it across multiple platforms. They had some good talk to share about their engine allowing easy porting of code across different mobile platforms. Glu Mobile belives in Unity and had some good points to share about using the platform to develop freemium games. I spoke about my experience of working with Flash on different platforms, specifically devices. My thoughts were that Flash developers have the advantage of taking their ideas to multiple mobile platforms through the Adobe AIR runtime, but that can come with some limitations. The native platform for devices offer more polished APIs than AIR thus giving it an edge over Adobe AIR. With the introduction of native extensions, Adobe AIR can open up better development options but that will only be known in time. However having said that, HTML5 is an new standard for the web that developers can be excited about, especially since Apple has been talking about it for a very long time, Adobe is investing heavily in the tools, and companies like Zynga believe that they can push the envelope of online social gaming with it. The consensus was that a developer should never be limited with an idea because a technology is known and comfortable to work with, instead choose tools and platforms that best help bring the idea to life. Thank you for the post. Can you share video of the panel discussion. I all have certain advantages over the others that would ensure their presence on the web platform as a whole. But since we are talking about the games, I think that Unity 3D seals the deal. Particle systems, realistic water, terrain editor, skyboxes, lens flares, programmable and event driven physics, you name it. Its the Unreal engine of the web! With the pro version, you get real time shadows ( I think soft shadows also but not sure ) , really good camera and audio effects. It also has really great acceptance in the indie community as the free license version can publish on iOS and Android and with other licenses, you get PS3 and XBOX too. Due to easy porting across these platforms developers just want to learn only the Unity Engine and cross platform development which is usually such a pain is literally a click away. I cant really say much about HTML 5. From my limited reading, I am really sure that its going to take the multimedia content to the next level. But at the same time, the games would have evolved too. Unity obviously has what it takes to do that, but can HTML 5 do it? I dont know, however I heard that Unreal or Doom,( I forgot which one ) was ported and running on it well. Honestly I am not at all surprised to hear what Zynga has to say. Given the history of their products (ie. pseudo games that are mothing but UI accompanied with sound and lackluster 3D models with bright and fancy colored photo-unrealistic textures ) they don’t really need some high end 3D graphics rendering engine. So far developers have been hindered because of low broadband speed and penetration, due to which high quality visuals and high budget games were not affordable. With this problem being rubbed away fast, online interactive content needs to evolve and give the users better quality products. When people think of online games, they think of games which are not even comparable to the AAA quality games they play on their console or PC. I think that Unity is leading a revolution that will be able to introduce a new category of online game. Games that don’t compromise on quality, which can have good graphics of a “serious game ” and can still have the touch and gameplay of the casual game. Being a Unity user myself, I don’t imagine ( and I don’t even want to !) that Unity will fall out of popularity and all that I have learnt will be of no use. Thanks for reading this comment. I hope that this big essay will not be received as spam, but I couldn’t stop myself when I read the topic!